The AA Navigator 7500 satellite navigation system includes UK and Ireland map data and also live traffic alerts including current traffic speed. 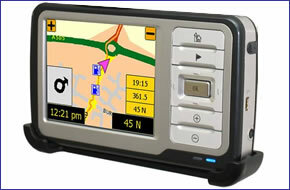 The 3.5-inch QVGA TFT colour screen provides turn by turn voice instructions. AA Navigator Navcam 7500 TMC has been discontinued. The AA Navigator Navcam 7500 includes full street-level mapping. It has 3D map mode for a perspective view of the road ahead and 1,000's of points of interest (POI's) including AA hotels and restaurants. The AA Navigator Navcam 7500 includes a 256 MB SD card incorporates AA Navigator software and maps of Great Britain and Northern Ireland.